Stinkhorns! These foul-smelling fungi are popping up all over in the mulch around my property now that we are in the dog days of summer. They seem to love the hot and humid weather. Stinkhorns are at once amazing and repulsive. They come up overnight, emerging from a little “egg” sac on the forest floor. They produce a gross, odiferous slime that attracts flies. The flies are tricked into thinking they are coming to a decaying animal, and as they crawl around in the ooze, they pick up spores. Off they go, moving the spores of the fungus to a new location. Ingenious! The shapes of stinkhorns are also pretty notable. There is an entire group of them with a distincly phallic appearance. The ones coming up in my yard right now–stinky squids– look like crab claws in my opinion! They all have three orange “arms” branching out from a common stem. 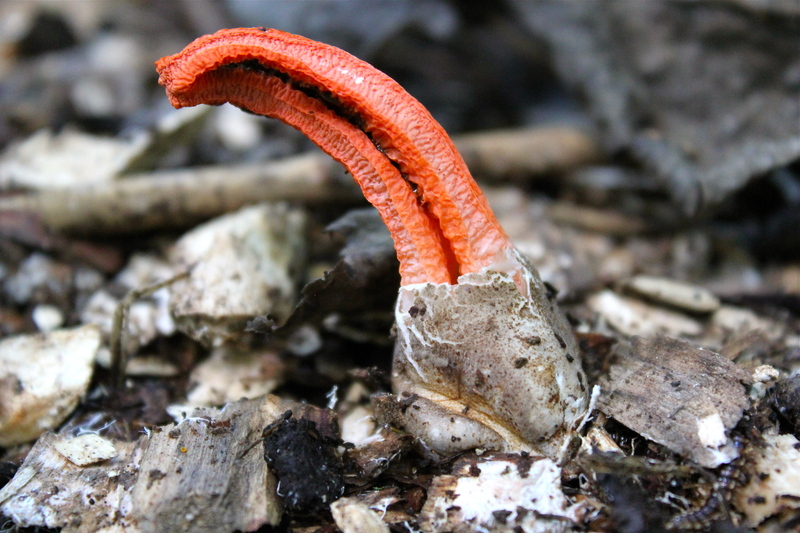 Other stinkhorns can look like dipsticks, wiffle balls or sea anemones. Who can’t appreciate a little humor in nature? Some of these look like crab claws coming up out of the ground! Why not let them be?